A synchronous and harmonious flow of energy throughout the body is important to good health. Whenever there are blockages in the energy flow in the tissues in any part of the body, ill health can result. Ondamed is a pulsed electromagnetic frequency (PEMF) device that offers a highly specific biophysical analysis and application based on electromagnetic inductivity. It’s principles are based on biophysics and quantum theory. It combines pulsed electromagnetic field technology and pulse biofeedback. It is an excellent complement to any type of medical treatment regimen. Dr. ChinQuee employs the revolutionary Ondamed biofeedback machine to identify blockages and help create a harmonious flow of energy throughout the body. Using the patient’s pulse, Dr. ChinQuee and her team are able to determine which frequencies cause a response in the patient’s autonomic nervous system. It is a simple and gentle, yet most effective application used for the purpose of inducing healing. Ondamed sends modulated electromagnetic frequencies to stimulate the connective tissues which store nutrients and toxins in the body (the extracellular matrix). A pilot study conducted by Joel Edman, DSc, FACN, CNS of The Myrna Brynd Center for Integrative Medicine at Thomas Jefferson University demonstrated “significant improvement in pain levels’’ with the Ondamed Pulsed Electromagnetic Field device. Trigeminal Neuralgia, Shin Splints, Healing of Bone Fractures, Musculoskeletal Pain, Fibromyalgia, MS, as well as the aforementioned conditions. The case studies will guide future larger scale research that will help confirm the best use and best protocol for a variety of conditions. Ondamed is also more recently being recognized in the aesthetics and anti-aging arena. It is being touted as the new age technology for ageless beauty by providing balance to patients from the inside out. Through this technology, Dr. ChinQuee is able to promote beauty by offering patient-specific treatment protocols for detoxification, weight loss, skin care, anti-aging, anti-stress, and overall well- being. There are also treatment protocols for smoking cessation. Electromagnetism is one of the four fundamental interactions in nature. It is the force that causes the interaction between electrically charged particles; The areas in which this happens are called electromagnetic fields. Humans are electromagnetic beings and are receptive to electromagnetic vibrations. Electromagnetic stimulation induces subtle current impulses in the body’s fluids, organs, tissues, and cells. The largest organ in the body is the connective tissue, which connects all cells and organs in the body. The flow of electrons takes place in the connective tissue. Ondamed is a form of Energy Therapy whereby pulse electromagnetic fields are sent into a patient’s body with frequency ranges between 0.1 to 3200 Hrz. This unique technology locates underlying dysfunction as it simultaneously provides treatment. Most people already know about the EKG (electrocardiograph). Many may already have had one done at their doctor’s office. It is a simple procedure that picks up and records the electricity in and around the heart. A heart cannot function without it’s electrical parts that generate, conduct and so guarantee the flow of electricity through it to keep it beating. It is the same with our brains. the EEG (ElectroEncephaloGraph) picks up and records the electricity in and around the brain, the so-called ‘brain waves’. So both the EKG and the EEG pick up waves, and we hope that these waves are normal. Sometimes they are not. There are many more waves in our body which have not been used yet by doctors. Examples include electrical waves of ill parts of our body. Ondamed has done decades of research and can use these ‘ill’ waves. It can find them and stimulate healing with special waves of its own, which fit exactly to the ‘ill’ waves. A series of at least 10 -12 sessions, each lasting no more than 30-45 minutes, is recommended but it really depends on the state of the body concerned and how far removed from good health it is. Commonly there are immediate responses of feeling better and being energized and calmed down. The issue, however, is really to “retune” the entire body optimally. 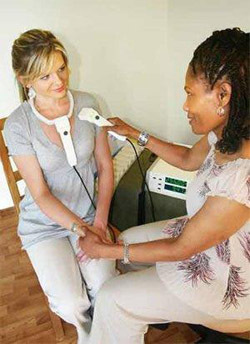 Significantly, each Ondamed session is unique for each patient and is independent of prior sessions. In view of the absolute dynamism of the human body, it is an in-the-moment interaction between the Ondamed System and patient. As has been proven for the past 13 years, the Ondamed Biofeedback System , makes any current treatment protocol work faster and more effectively so that, in time, reduced dosages and numbers of drugs are required, if at all. Does Ondamed Have Any Side Effects? The impulses delivered by Ondamed generate a current of electricity in the cells on the order of millivolts. It is completely safe because it never delivers more than what the body’s own electrical system generates. Muscle contraction for instance generates about 80 millivolts whereas Ondamed never exceeds 40 to 50 millivolts. One of the side effects of Ondamed therapy is detoxification. This may, soon after treatment, result in the passage of foul smelling stool, urine or even bodily sweat. Sometimes, the detoxification process may, in addition, take the form of a sore on some part of the body which drains fluid for a short period and then heals completely as recovery continues..
On rare occasions, there occurs a brief exaggeration of the presenting symptom, quickly followed by the onset of relief and resolution. All of these are healing reactions which confirm that a response has been elicited in the cells. Usually, treatment would be suspended as soon as any such reaction begins and for as long as it lasts. Treatment, if necessary, will be recommended after it (the healing reaction) has subsided. What Makes Ondamed Unique From Other Energy Medicine Devices? What really separates Ondamed from other Energy Medicine devices is that through its unique vascular autonomic signal bio-feedback method, the directive for treatment comes from you, the patient, rather than from the practitioner. Whereas with other Energy Medicine devices, the practitioner offers the patient what he/she suspects the patient needs. 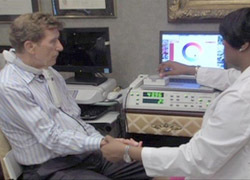 With Ondamed, the practitioner is told by the patient, via his pulse feed-back response, where and what (i.e. which frequency) to treat. Please call and schedule a consultation with Dr. ChinQuee to find out if Ondamed is an appropriate treatment for you.